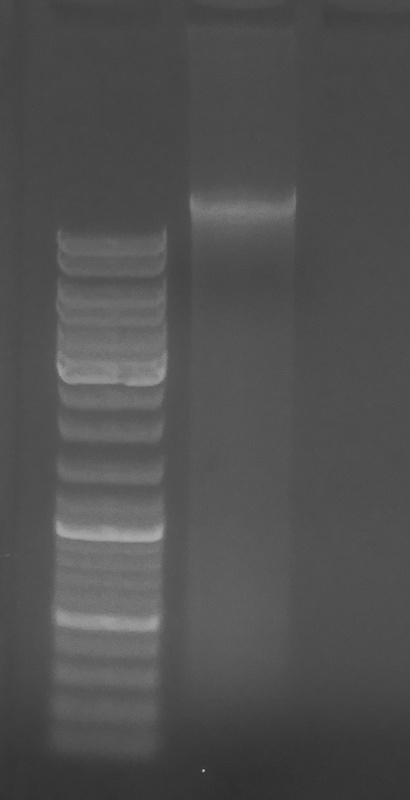 I recently ran gDNA isolated for geoduck and Olympia oyster genome sequencing, as well as gDNA isolated from the Olympia oyster reciprocal transplant experiment out on a Bioanalyzer (Agilent) using the DNA 12000 chips. The results from the chip were a bit confusing and difficult to assess exactly what was going on with the DNA. 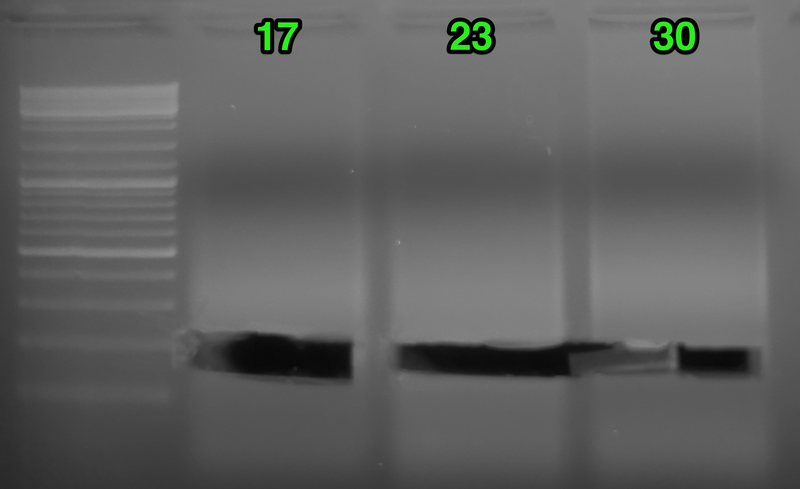 So, I ran 5μL of each of those samples on a 0.8% agarose 1x modified TAE gel w/EtBr to get a better look at how the samples actually looked. 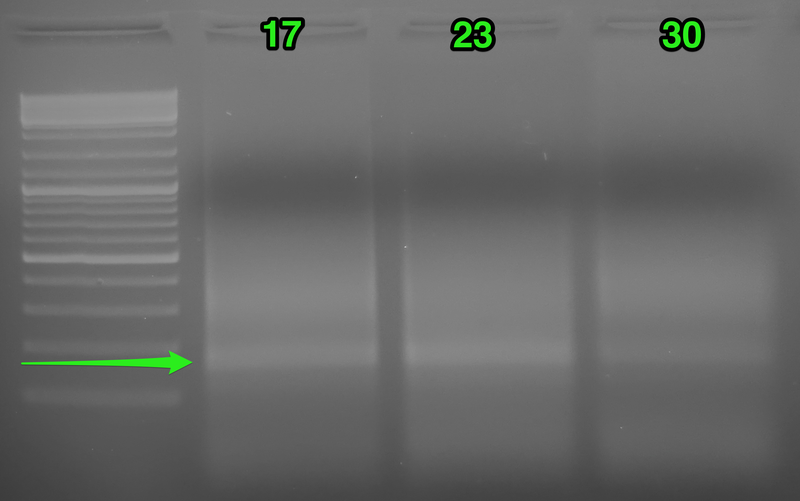 Both the geoduck and the Olympia oyster samples for genome sequencing show intact, high molecular weight bands with some smearing (i.e. degradation). The oly sample looks a bit funky, most likely due to a gel anomaly. 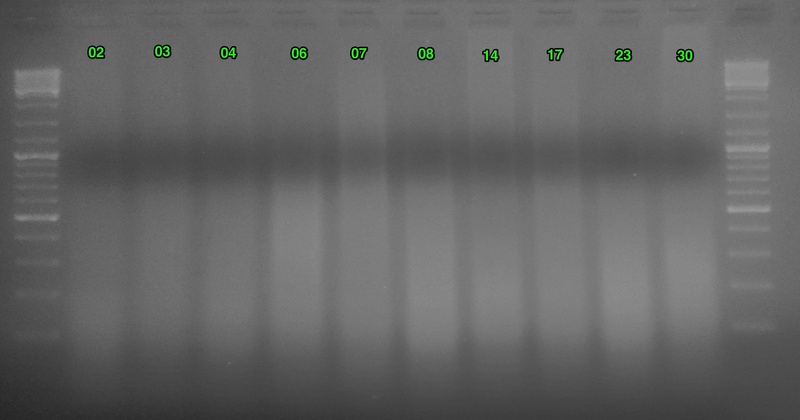 I’ll quantify these using a dye-based method for a more accurate quantification before sending off to BGI. The Fidalgo 2SN samples all have intact, high molecular weight bands, but most of the samples show extensive smearing (i.e. degradation). 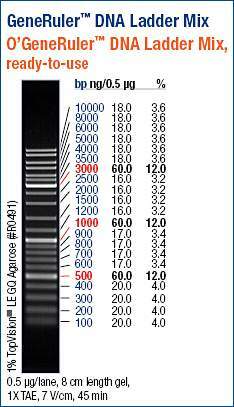 However, sample 2SN 35 has no visible DNA at all. 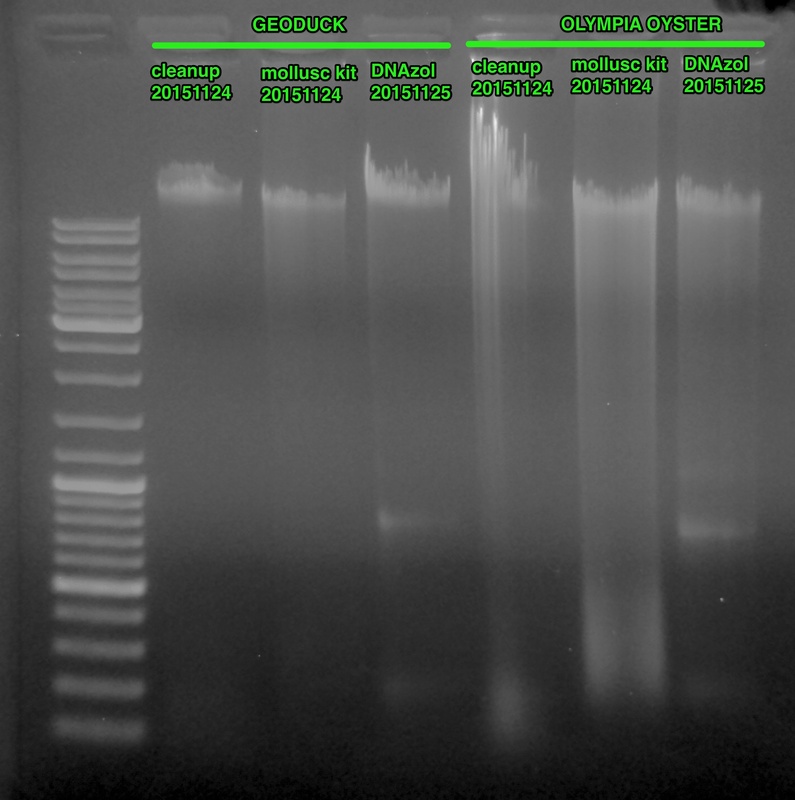 The fresh ctenidia samples were isolated by me on 20151021 and by Mrunmayee on 20151023. The frozen ctenidia samples were isolated by me on 20151103. It’s interesting to note that Mrunmayee’s isolations appear to exhibit the least amount of degradation. Besides her handling the samples, the primary difference is that her samples were incubated in the buffer/Pro K solution O/N @ 37C, while my fresh samples were incubated @ 60C for 3hrs and my frozen samples were incubated @ 60C for 1hr. Overall, though, the frozen samples look the worst. Finally, it’s also interesting to see that the two samples isolated using DNazol (geoduck and Olympia oyster genome samples) migrate more slowly than the remaining Olympia oyster samples which were isolated with the E.Z.N.A. Mollusc Kit.